Open Access Week Seeks to Address “Textbook Crisis” | The Gettysburgian. 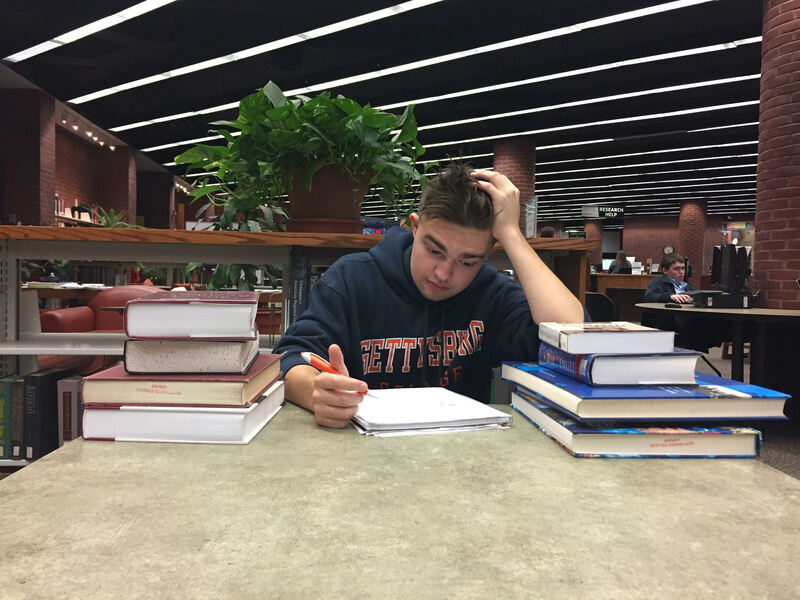 Jay Hauser ‘19 spent $391.43 for a single course’s materials during his first semester at Gettysburg College. In fact, a 2016 analysis conducted by College Board found that the price of books and supplies for a full-time student at a private nonprofit 4-year college, like Gettysburg, was $11,890. Add in the cost of tuition, room and board, and living, and suddenly it is clear why college students so often are finding nutrition in ramen noodles and microwaveable hot dogs. As with many other industries, there have been many mergers and acquisitions in the publishing industry. This has led to a small monopolized industry of large, powerful publishing companies, with few opponents to consider. Because of this, companies can set extremely high prices without having to worry about being outcompeted. Since their main market is students, who are compelled consumers, publishing companies need not worry about having appealing prices: students will have to put up with whatever price they set. Musselman Library has expressed deep interest in making Open Access (OA) and its many components a real partner in the educational materials for Gettysburg students. Accordingly, Musselman Library’s 2017 OA Week, taking place Oct. 23-27, will orient more towards how students can advocate for change. Open Access provides readers with free access to published research, while still remaining within the confines of copyright and license restriction. Open Access advocates that education and knowledge are a right, not a privilege, and works to provide information for all, regardless of class. Janelle Wertzberger, Assistant Dean and Director of Scholarly Communications, and Chris Barnes, Scholarly Communications Librarian, are leading OA Week in order to uncover what students are really paying for textbooks and teach students what they can do to change that. Many professors at Gettysburg have already started making changes to their curriculums to include more open access material and lessen the cost of course materials. Ian Clarke, who teaches a first-year writing course “Writing Through Literature,” has successfully created a curriculum with a zero-dollar cost. Clarke explored open access texts for his course and found that there were many incredible options that did not cost a dime. By utilizing Project Gutenberg, a hub for Open Access, Clarke found works by authors including James Joyce, Mark Twain, and Virginia Woolf. Clarke is not the only one who has made use of Open Access. Josef Brandauer, Associate Professor of Health Sciences has begun to utilize open access resources in his statistics class. Remembering his own struggles paying for textbooks in college, Brandauer wanted to ease the burden on his students as much as possible. “When I do announce that the online version of my statistics textbook is free, and they can order a hardcopy from Amazon at a minimal cost, there is generally a sense of relief,” Brandauer remarked. He noted that while he never experienced a student who asked him to look into cheaper options, he would welcome that conversation. The concept of free education is extremely idealistic. Janelle Wertzberger is aware of this and does not expect for every course at Gettysburg to be able to reduce its costs to almost nothing as Clarke, Brandauer, and Glass have done. OA Week urges students be more engaged in advocating for change. “If a student is interested in influencing the materials that are assigned in classes, I think they can begin a conversation with their professors about the materials that were chosen and whether the cost of those materials was taken into account,” Wertzberger suggested. Among other activities, during Open Access week, students will be invited to contribute to a wall of post-it notes in the library that will show the amount of money individual students at Gettysburg spend on textbooks relative to their peers. The rising cost of textbooks is a worthy issue that needs attention. This account, however, quotes Jay Hauser ’19 as required to purchase expensive “classical text[s] of philosophy.” This comment concerned me as Chair of the Department of Philosophy, since our faculty strongly support the Open Access initiative. I found that this student has never taken a class in either philosophy or classics. I am not sure what course or department he is actually referring to here, but to leave this comment as the primary example in your story is unfortunately misleading.